Office 365 uses the cloud-based user identity management service Azure Active Directory to manage users. You can also integrate your on-premises Active Directory with Azure AD by synchronizing your on-premises environment with Office 365. Once you set up synchronization you can decide to have their user authentication take place within Azure AD or within your on-premises directory. You can either use synchronized identity or federated identity between your on-premises organization and Office 365. With synchronized identity, you manage your users on-premises, and they are authenticated by Azure AD when they use the same password in the cloud as on-premises. This is the most common directory synchronization scenario. Pass-through authentication or Federated identity, allows you to manage your users on-premises and they are authenticated by your on-premises directory. Federated identity requires additional configuration and enables your users to only sign in once. For details, read Understanding Office 365 Identity and Azure Active Directory. Want to upgrade from Windows Azure Active Directory sync (DirSync) to Azure Active Directory Connect? If you are currently using DirSync and want to upgrade, head over to azure.com for upgrade instructions. You get a free subscription to Azure AD with your Office 365 subscription. 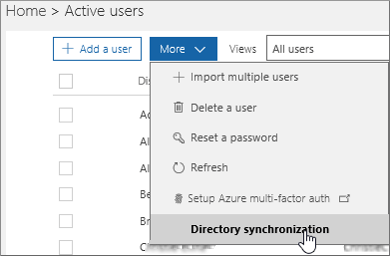 When you set up directory synchronization, you will install Azure Active Directory Connect on one of your on-premises servers. Verify your on-premises domain (the procedure will guide you through this). Have Assign admin roles in Office 365 for business permissions for your Office 365 tenant and on-premises Active Directory. Windows Server 2012 R2 - PowerShell is installed by default, no action is required. - Net 4.5.1 and later releases are offered through Windows Update. Make sure you have installed the latest updates to Windows Server in the Control Panel. Windows Server 2008 R2 with Service Pack 1 (SP1) or Windows Server 2012 - The latest version of PowerShell is available in Windows Management Framework 4.0. Search for it on Microsoft Download Center. - .Net 4.5.1 and later releases are available on Microsoft Download Center. Windows Server 2008 - The latest supported version of PowerShell is available in Windows Management Framework 3.0, available on Microsoft Download Center. If you're using Azure Active Directory DirSync, the maximum number of distribution group members that you can synchronize from your on-premises Active Directory to Azure Active Directory is 15,000. For Azure AD Connect, that number is 50,000. To more carefully review hardware, software, account and permissions requirements, SSL certificate requirements, and object limits for Azure AD Connect, read Prerequisites for Azure Active Directory Connect. You can also review the Azure AD Connect version release history to see what is included and fixed in each release. Sign in to the Microsoft 365 admin center and choose Users > Active Users on the left navigation. In the admin center, on the Active users page, choose More > Directory synchronization. On the Active Directory preparation page, select the Download Microsoft Azure Active Directory Connect tool link to get started. For more information about the Azure Active Directory Connect installation process, see Azure AD Connect and Azure AD Connect Health installation roadmap. After you have synchronized your users to Office 365, they are created but you need to assign licenses to them so they can use Office 365 features, such as mail. For instructions, see Assign licenses to users in Office 365 for business. Follow the steps in Create DNS records for Office 365 when you manage your DNS records to finish setting up your domains.